Today we are able to sleep in a little later than yesterday since the drive wasn’t as long and our first stop wasn’t until 11:00. After another breakfast of muesli, over-easy eggs and coffee, we headed off for a day of monasteries south of Stuttgart. We also had two additional guests joining us today! Andrew Ulmer, a former Harvard University student and now an organ student at the University of Tübingen. Our other guest was Helmut Völkl, a local scholar on the style and function of the southern German organ…it’s history, liturgical use, design, and characteristic sound. We are deeply thankful to Andreas for his valuable help behind the scenes—sending emails and making contacts—in order to get us into some of the venues. Helmut gave us descriptive insight into the history of the organs we saw and heard. But before the three monasteries, what would a road trip be without a pitstop?! And what a pit stop it was. Somewhere in the Schwarzwald (the black forest that blankets southern Germany) is a little village by the name of Zwiefalten. Driving down a steep mountain switchback road, we enter a tiny, calm, and unassuming hamlet that houses a massive baroque church that can be seen from high up on the road. It stands quite central in the town as well. Surrounding by a flowing brook and a small garden area, it houses some of the most spectacular baroque adornments that one might ever come across. 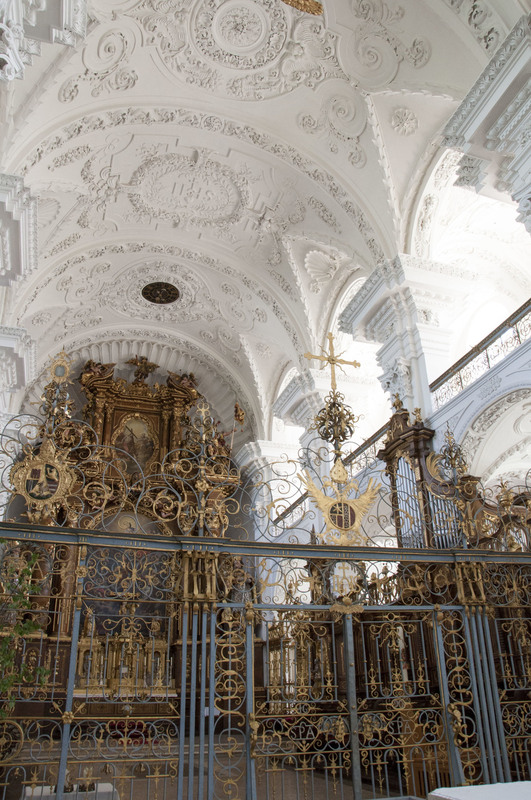 It is from the late baroque, built by Johann Michael Fischer from 1739-1765. Pictures can not do it proper justice, but they will try. A late departure from Zwiefalten saw us arrive a little late at our first scheduled stop, Obermarchtal. After navigating typically narrow European village roadways (ahem, carriageways turned roadways), we park and walk into the cloister walls and into another baroque marvel. Founded in 1500, it is called the Marchtal monastery and was dissolved in 1803. Inside is a splendid organ from 1780 by Johann Holzhey. 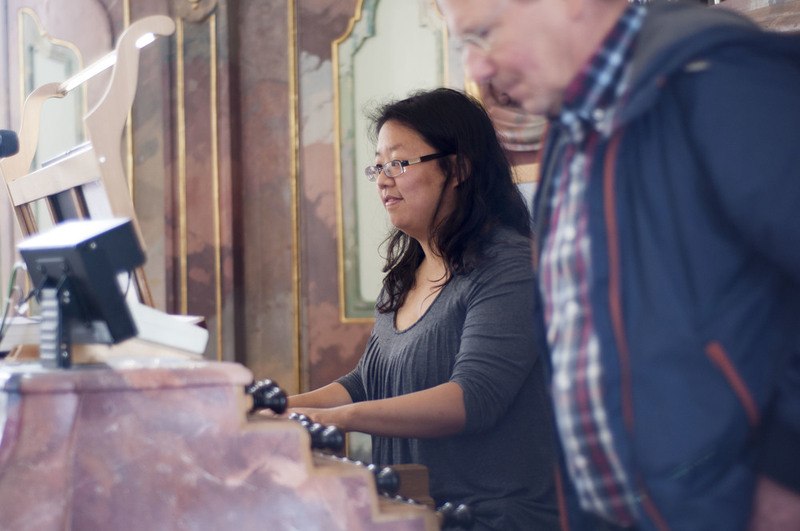 Consistent in its construction with the southern German style, all of the divisions of the organ are housed in one case from which it is impossible to determine how many divisions there are or where they are located. The ornately painted organ case extends across the centuries-old loft. Gilded rococo ornaments frame the pipe facades. This console, as was explained to us by Helmut, provides to the organist the advantage of sitting face front toward the altar, rather than with the back to the altar as is the case in many American churches. Helmut informed us that this was the norm for the time in this area. Another norm for this style and era was the additional small organ located at the very front of the church for smaller services, while the festorgel, or festive organ, at the back of the church was used for Sunday Mass and big occasions. For organist-readers: the disposition of the organ is spread over three manuals and pedal. As typical in this style, the pedal division is small(er) than the manual divisions. It contains flues at 16’ 8’ and 8’, a cornet of five ranks, and three reeds at 16’ 8’ and 4’. The main division, or Hauptwerk is expectedly the largest, containing many 8’ ranks of various timbres along with three mixtures. The second manual, or Positiv, again has many 8’ ranks along with the usual upper work and bright mixtures. The third division, or Echowerk, contains the more interesting colors of the instrument, including a Vox Humana, Cromorne, Schalmei, and the Nachthorn. The flutes on this organ are all individually distinct and provide an endless color palette. We played works by Pachelbel, Froberger, Knecht and others. These composers are all associated with the southern German tradition and the timbres of this organ made these pieces come alive. Grabbing a quite bite to eat en route, we soon arrived at our next location, Ochsenhausen. Built between 1489-1495, this monastery is more gothic in its architecture with a long narrow nave. However it incorporates many baroque features from later additions and an 18th century redesign provided it with a much lighter interior. The splashes of soft pink throughout give this space a true sense of calm. 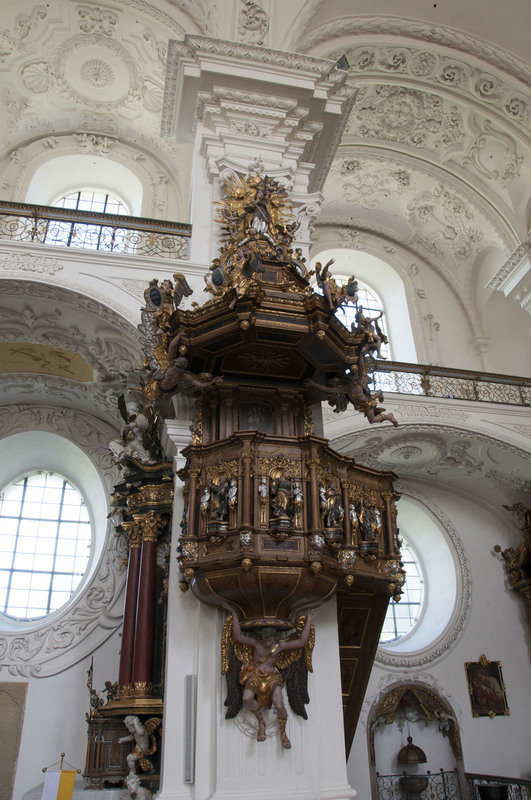 Another centerpiece feature of this monastery is the highly ornate pulpit, adorned with skillfully carved angels ascending up the wall of the nave. 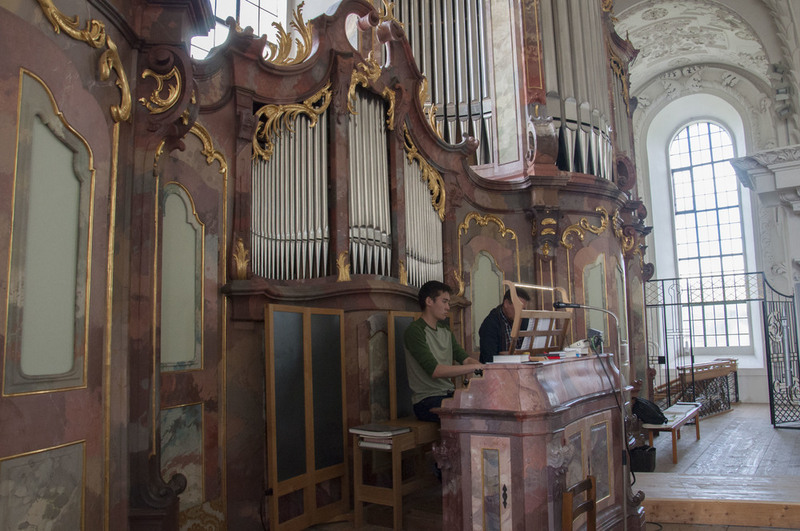 The organ built by Joseph Gabler in the Ochsenhausen monastery was, for us, a preview of the larger and perhaps more famous Gabler organ that we would see later today. However it is truly a gem of gems in its own right, and indeed one of the most beautiful works of art in the entire organ culture. 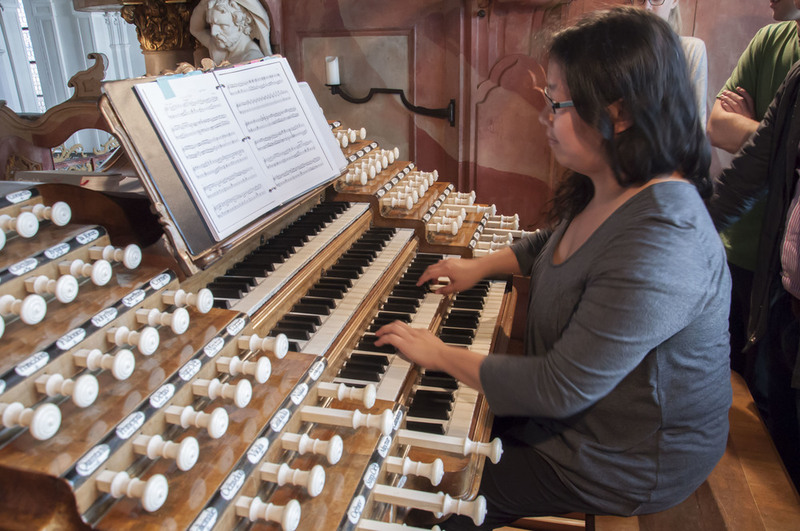 From 1734, the organ shares some characteristics with that of Obermarchtal. Some of those are the long case filling the width of the gallery, the forward facing console, and the abundance of 8’ ranks. Attention to detail is not spared with this or the other Gabler organ that we were yet to visit. The exquisite painting brought the entire case to life, even the parts that would never be seen by anyone but the organist. The disposition is distributed over 4 manuals and pedal. The Hauptwerk here again contains three crowning mixtures. The Brustpositiv is located on the railing of the balcony (which is a difference from the previous instrument) and contains a biting and nasal Vox Humana. The Solo division houses no less than six 8’ stops, a true hallmark of this style. The fourth and final division, the Echo, contains some softer flues, a bright mixture, and an oboe stop. If one thing were to stand out and set this instrument apart from all others, it is the cuckoo stop. Now, the idea of a cuckoo is not all that uncommon. Other percussion and sounds such as chimes, bird whistles, rumbles, spinning bells, etc., are not all that uncommon either. What is completely unique here is the incorporation of the name of the town into the organ. Ochsenhausen translates to ‘the house of the ox,’ and indeed the name of the town was named after an event involving oxen 1000 years ago. Pulling the ‘Cuculus’ stop causes a small ox to emerge from a small set of doors above the Brustpositiv division (the one on the gallery railing) and whistle like a cuckoo bird. Odd indeed, but I’m sure Mr. Gabler had a smirk on his face as he installed that. 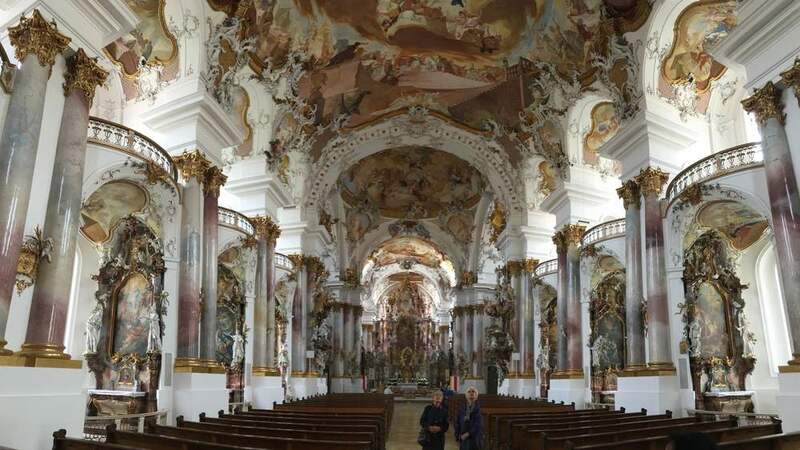 Another hour-long drive brings us to Weingarten, the location of a Basilica dedicated to St. Martin that houses a famous Gabler organ built between 1737 and 1750. Thirteen years may seem long, but is actually quite short when viewing the intricacies of the mechanics involved. Personally, Weingarten has been at the top of my list of places to see for many years, so this quite a thrill to finally see and hear in person. 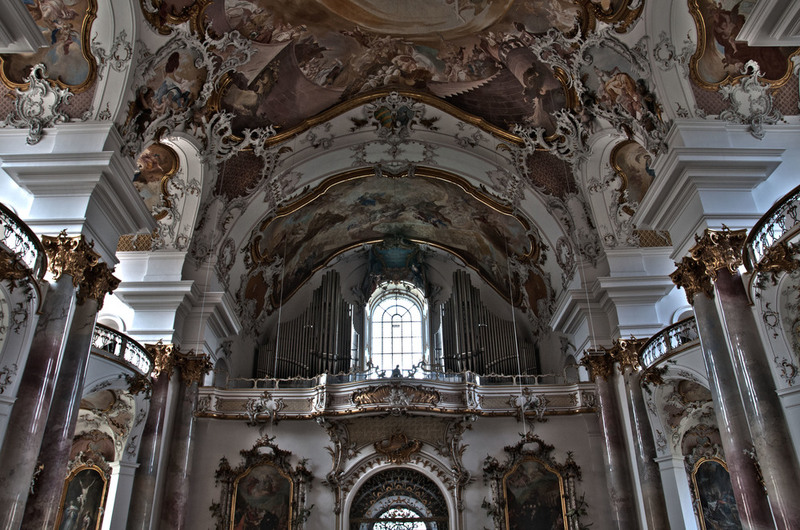 At one half the size of the Basilica of St. Peter in Rome, the Weingarten Abbey, constructed from 1715 to 1724, is richly decorated in the baroque style and stands high on a central hill and can be seen from miles away as one approaches. 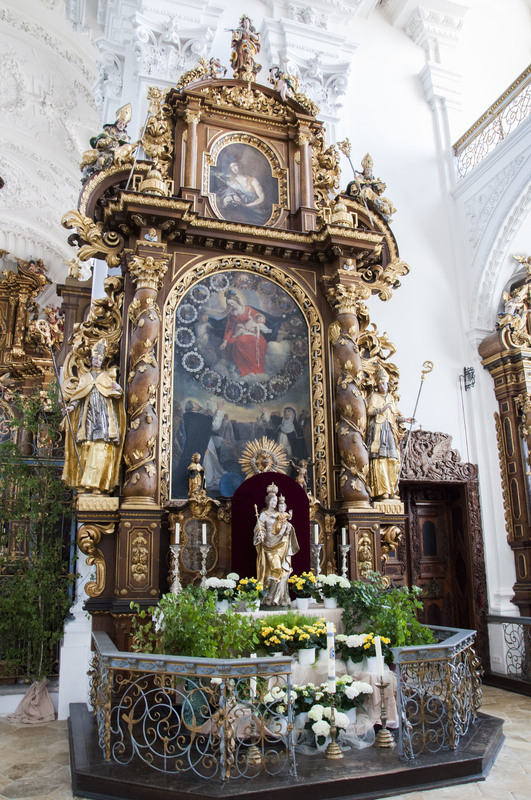 While this abbey has less decoration on the inside, the baroque elements can still be seen in the high altar and on the even more ornate pulpit, which seems to hang on the wall, lacking any visible staircase to enter it. What sets this organ apart is its genius design. The pipe facades are placed in such a way to not block any of the rear windows. The mechanics of getting all of the wooden connections to these pipes is, simply, a labyrinth of wooden sticks. Listed as the 44th largest organ in the world, the stops of this organ are distributed across four keyboard divisions and pedal. Here one finds even more percussion effects. One of these references the name of the town—Weingarten, meaning ‘wine garden’—in the form of groups of chimes over the head of the organist in the shape of a bunch of grapes. There is also a cuckoo stop, a bass drum effect stop, and a nightingale bird stop. But the most decadent of all is ‘la force’: a 49-rank mixture that only plays on one note—the lowest C in the pedal. All of this organ playing made us hungry! Döner Kebab, a turkish dish of shaved/shredded beef, fixings, and a sauce, was just the thing to hit the spot. At this point in the day, we are only a half hour drive from the Swiss border, which on the other hand also means a lengthy evening drive back to Tübingen.